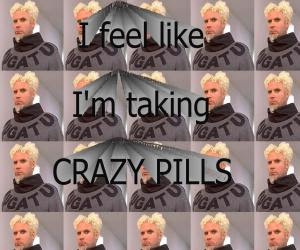 Alexa Shrugged: America is Taking Crazy Pills!!! America is Taking Crazy Pills!!! One of the most frustrating things about the McCain loss is that the reasons I dislike McCain are the same reasons he should have won. John McCain was the true candidate of change. He has a long history of defying Republicans and working with Democrats. As a conservative, this has driven me nuts, but supposedly America was looking for more bipartisan leadership, a unifier ... and they settled on the most liberal Senator with no record of reaching across the aisle. After the bitter 2000 primary battle, McCain held a grudge against the new President Bush and Republicans. He voted against the Bush tax cuts. He worked with Democrats for McCain-Feingold campaign finance reform - which conservatives believe is unconstitutional because it restricts free speech; the McCain-Edwards-Kennedy Patients' Bill of Rights - which conservatives opposed as undue government interference in the free market; McCain-Lieberman global warming - which conservatives do not believe is man-made and thus cannot be stopped; McCain-Kennedy amnesty for illegals - which conservatives are vehemently against. On all these positions, McCain is more than moderate, he is liberal, joining up with some of the most liberal members of the Senate. Clearly he can work well with others and make compromises with the left - which I don't like, but America professes to love. Oh, and I almost forgot - McCain was rumored to be considering changing his party affiliation in 2000 before Sen. Jeffords made the leap and gave the Senate to the Democrats. McCain was also rumored to be on John F. Kerry's VP list. He further irked conservatives when he joined the Gang of 14 - the group that forced a compromise in the impasse of judicial confirmations. When Democrats wouldn't allow the full Senate to vote up or down on judicial confirmations, conservatives wanted to go for the "nuclear option," which would only require a majority, rather than 60 votes to bring them to the floor. A Republican argument against going nuclear is that when Democrats come into office, they will also use the nuclear option for their judges. Well, we didn't end up going nuclear, but mark my words, the Dems WILL. better than either Hillary Clinton or Barack Obama, I had to put aside my qualms and back him. I had to continue to defend him even though, through the course of the campaign, he pledged to include Democrats in his cabinet, considered Lieberman for VP, supported the bailout, continued to oppose drilling in ANWR, and attacked Obama for not taking public financing. All of which are anathema to conservatives, but should have endeared him to Americans looking for change in Washington. McCain was the anti-Bush candidate, the candidate of change, the unifier, the true maverick, the bipartisan compromiser willing to throw out his ideals in the name of consensus - all of which I HATE and yet I supported him and America, wanting all these qualities, went for OBAMA! If you don't mind me asking, who were you rooting for to be the Republican candidate way back when? I didn't really have a favorite. When I took one of those online quizzes to find out who you are best matched with, I came up with Duncan Hunter, next Mitt Romney. I guess my choice was Mitt at the end. I can so relate to this post! I felt the same way about McCain....but he was certainly the lesser of the two evils! Main problem with the Repub contenders was none of them was particularly strong. I liked much of what Fred Thompson had to say, but he didn't seem to have a fire in him for the fight. You can't support a candidate that compromises on so many issues and then still claim to support those principles. McCain is scum and always has been. I've proudly opposed him since 2000 and openly opposed him starting in 2006 - my site: http://mydearjohnletter.com/ - and proudly didn't vote for him this year. How about next time we get a candidate with real principles as opposed to a Democrat that keep an "R" after his name? he voted with bush more than any other republican and proudly proclaimed that during the campaign. he may have "considered" lieberman, but he CHOSE caribou barbie!! Anonymous, that is simply not true - McCain did NOT vote with Bush more than any other Republican nor did he say that during the campaign. There was a clip from around 2003 or 04 where McCain was trying to defend himself from Republican attacks by highlighting his votes with Bush, but he never voted with him more than anyone else. Look it up instead of relying on your Obamessiah to spoon-feed you lines. I love how the media praised McCain and touted him as the Maverick, but as soon as he got the GOP nom, that went sour. I really do attribute much of this election to how McCain and Palin were portrayed in the media...because when it comes down to it, there are so many people at the polls voting not on issues, but on which candidate makes them "feel better" or "looks like [them]." Your first paragraph pretty much summed it up. I think if there is one thing I never forgave him for was the overtures to Kerry in 2004. Alexa, I just found you through another conservative blog -- doctorwifemom. Not only do I agree with what you have to say, your profile sounds like it could be my own. Conservative, and getting more so as each day passes. Keep up the good work. I'll be back. I found you through Doctorwifemom blog and am very impressed! If you go to my blog through her blog you will find out another world of things that McCain is tied to. He is killing off the Arizona Native American's and their lands at a heart wrenching rate! In my blog you will find out how he weasled into politic's. Watch the video's and listen, his history is even sleazer than anyone would think!